A first-class instrument, as befits one of the world's top players. Excellent build quality. 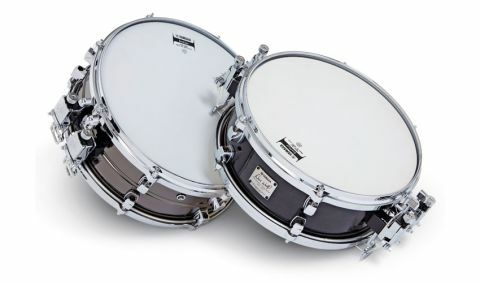 Dual snares offer extra sonic options. Last year was the 30th anniversary of Dave Weckl's association with Yamaha drums. From his early days with Chick Corea's Elektric Band to his present status as one of the world's most respected players he's always got a superb drum sound. His first Yamaha signature drums, in the early '90s, were aluminium and maple. His new limited edition model comes in brass and maple. Here we're looking at the latter. "The 45° bearing edges are perfectly cut and silkily finished"
Dave's drum has a 13"x5" maple shell, 6-plies and 6mm thick, finished on the outside in a black stain and clear lacquer through which you can make out the grain. The 45° bearing edges are perfectly cut and silkily finished, with proper 2.5mm-deep snare beds in the bottom. "If minimally damped, this drum also has a rich woody tone and could easily figure as your main snare"
We wondered at first if the fact that the paired snares are inevitably mounted slightly off-centre would diminish the response, but no - engaging either snare individually, the drum responds normally and fully. The maple snare with its 13" piccolo diameter provides a snappy, poppy sound (particularly noticeable when mounted next to the brass signature model) and, if minimally damped, this drum also has a rich woody tone and could easily figure as your main snare.